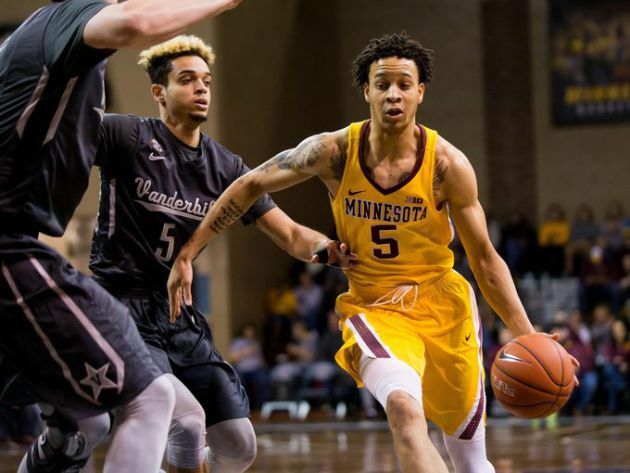 Amir Coffey's college debut season was one of the best for a Gophers freshman in more than a decade. Coffey’s upcoming sophomore year could establish him as one of the top guards in the country. A big step toward that goal might come from a solid showing Aug. 15-20 at the Nike Skills Academy in Los Angeles. The 6-foot-8 former Hopkins standout is among 20 college players invited to participate in the development camp, which includes 80 of the top high school prospects in the nation. Nike combined the position skills academies in past years held by NBA stars like Chris Paul, LeBron James and Kevin Durant into one week-long camp in Southern California. A collection of high-profile college and high school talent will get to compete against each other in front of NBA scouts, while also being taught by some of the NBA’s elite such as James, Durant, Kyrie Irving, Anthony Davis and others. Last season, Coffey earned All-Big Ten freshman honors after starting 33 of 34 games and ranking second on the Gophers in points (12.2), assists (3.8), steals (1.1) and free throws (110). His scoring average was the highest for a University of Minnesota freshman since Kris Humphries (21.7) in 2004. Coffey, who scored a season-high 30 points against St. John's, also finished with 3.8 rebounds per game. In conference play, he shot 41.8 percent from three-point range and tied for the Big Ten lead with 35.6 minutes per game. Two local high school standouts, Tre Jones from Apple Valley and Gophers commit Daniel Oturu of Cretin-Derham Hall, are also invited to the Nike Basketball Academy next week in LA. Jones and Oturu were senior teammates with the Howard Pulley Panthers, one of the top AAU teams in the Nike EYBL. Other shoe companies such as Under Armour and Adidas already held their development camps for high school and college players. The Adidas Nations (Rochester John Marshall's Matthew Hurt participated on the prep side) reportedly had 75 NBA scouts and team personnel in attendance last week. So Coffey's goals of reaching the NBA could get a big boost with a big performance next week in LA. From last year's Nike Skills Academy, there were 10 college players selected in the 2017 NBA Draft, including sophomores Tyler Dorsey from Oregon, Jawun Evans from Oklahoma State and Edmond Sumner from Xavier. Six underclassmen from last year's academy returned to school, most notably Michigan State's Miles Bridges.